Thanks to Forest Hall Chess Club, international chess is returning to the legendary Chillingham pub in Newcastle after a break of nearly 22 years – with the announcement that the Northumbria Chess Masters is to be held there from February 14-18, 2018. The Chillingham occupies a special place in the chess history of our part of northern England. 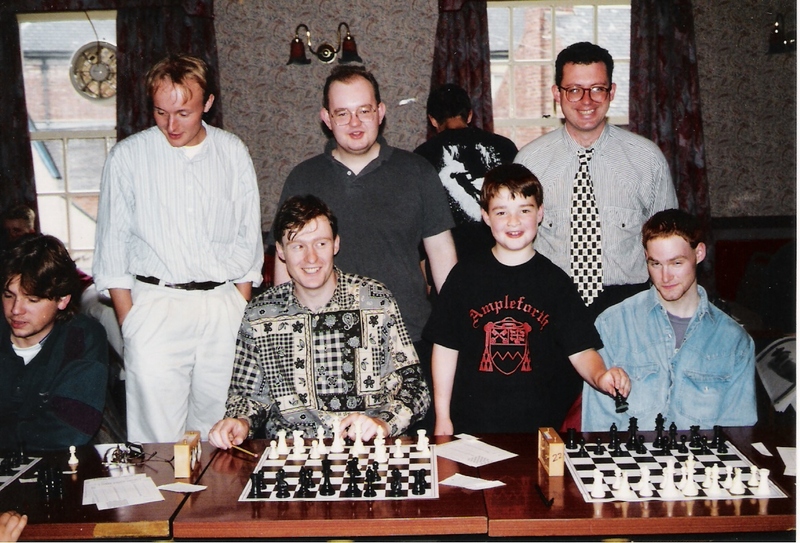 It’s where the current 2017 British Champion, GM Gawain Jones, made his international debut, aged 8, at the first Northumbria Masters back in 1996 (see picture above), and where several players achieved their first title norms. The tournament – a nine-round FIDE-rated Open – will again have opportunities for international title norms, and is aimed at bringing top-class chess to the North East for the first time since the British Championships were held in North Shields in 2012. The Northumbria Chess Masters will have a total prize fund of £2,300, including a 1st prize of £1,000. Other prizes are: 2nd £500, 3rd £300, 4th £200, 5th £100, top junior £100, and top Under 2200 player £100. To enter, simply download the entry form from the English Chess Federation calendar. Online entry is available here on this website. Alternatively, you can enter by emailing Tim Wall directly at: timpeterwall [at] gmail [dot] com, calling him on 0750 372 2366 or writing to him at: 7 Nixon Terrace, Blyth, Northumberland NE24 3EE. The idea is to hold the tournament over five days to enable people with busy work, school and college schedules to play a full nine-round tournament – the minimum length required to make an international title norm. Thanks to financial support from the English Chess Federation, we can offer a limited number of appearance fees to titled guest players (Grandmasters & International Masters) to ensure that there are enough non-English players to allow for title norms. Also, several local players are hosting a visiting GM or IM during the tournament. Players are expected from a variety of countries, making it a truly international event.